Bronze as issued AD 140-144. Silver denarius issued AD 153/154. Obv: ANTONINVS AVG PIVS PP TRP XVII, Laureate head facing right. Rev: COS III, Vesta standing left holding simpulum and palladium. Silver denarius issued AD 152/153. Obv: ANTONINVS AVG PIVS PP TRP XVI, Laureate head facing right. Rev: COS IIII, Fortuna standing holding rudder and out turned cornucopiae. Silver denarius issued AD 148/149. Silver denarius issued AD 139. Silver denarius issued AD 156/157. 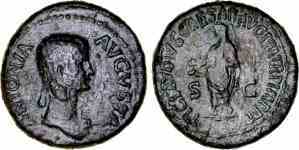 Bronze sestertius issued AD 139.